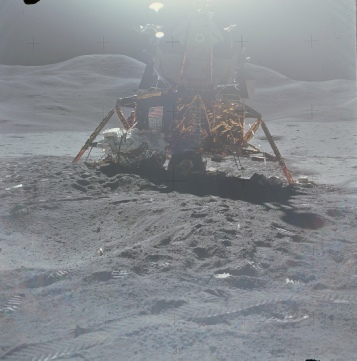 Apollo 15 was the longest mission so far in the programme, and as such would show the greatest degree of change in lighting conditions. It landed at 22:16:31, 30/07/71, and a couple of hour later (00:16 on 31/07/71) performed a SEVA or ‘Stand-Up EVA’, in other words they de-pressurised the LM, opened up the docking hatch, poked a head out and had look around for about 40 minutes. 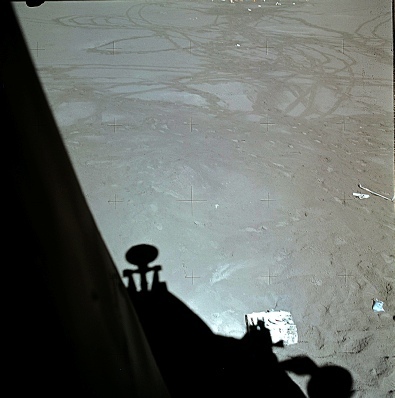 While they did this they took a series of photographs of their surroundings, and as luck would have it the LM shadow can be seen in a few of them at either end of the SEVA sequence. The one below is a crop and brightness enhanced view of AS15-85-11382, with three labelled craters. 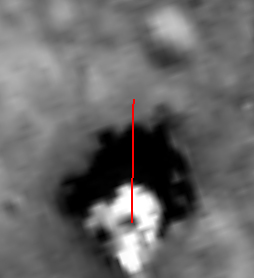 Those craters are also labelled in the image of the landing site taken by the LRO, which I have superimposed on the Google Earth. 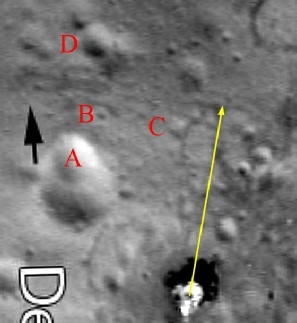 The distance from the centre of the LM to the centre of A is 28.3 metres, crater B 31.9 metres, and the distance to C is 27 metres. D is 42.6 metres away. 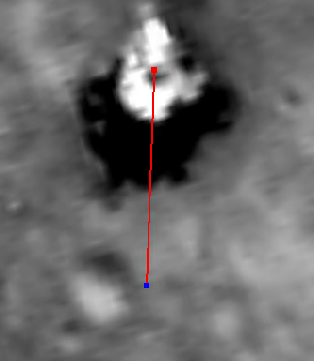 The LM’s shadow length during the SEVA should be around 30 metres on level ground, and this is represented by the yellow arrow. As can be seen from the photo below, it was far from level, and the margin of error is well within what is reasonable. We’ll return to the shadow visible in that image later. We have one final LM image on the ground to examine, and this one was taken after EVA-3, and it also shows discarded PLSS, so we can be more precise about when it was taken. LM equipment was jetissoned at 14:34 on the 2nd, so we can set a time of 15:30 as the earliest time available to them given how long it took to remove their suits. Lift off of the ascent module was 17:11, and given the amount of checking and so forth, it’s unlikely they would have considered any more photography much after 16:30. If we set a time 0f 16:00, we can therefore expect a shadow length outside the LM of just over 8 metres, based on a sun angle of just shy of 41 degrees. The image above left shows a sharpened and brightness adjusted version of this image to show details of the surface features more. The crater in the previous panorama can also be seen in this image, given away by the small white rock in the centre. 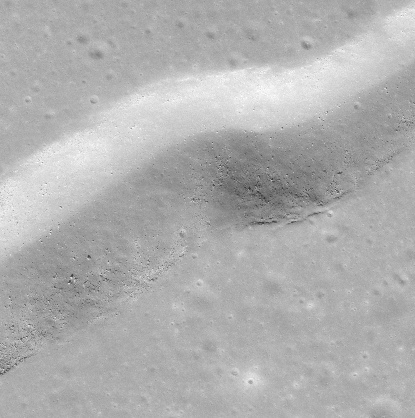 The astronaut footprints around the edge give a round indication as to its boundary. 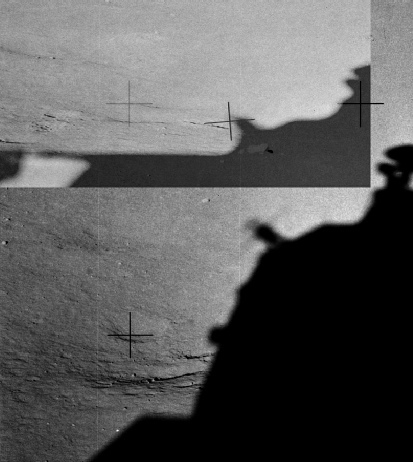 Above right is the LRO view superimposed with an 8 metre line which, as you can see, falls short of the crater in the LRO shot by about the same amount as it does in the Apollo image. That, sadly, is it for the LM, at least in this form, but there are other indications of the passage of time based on the movement of shadows on the landscape around them. Specifically we can look at the way Mons Hadley changes over the course of the mission, as many photographs were taken of it. Before we do that, let’s set some context. 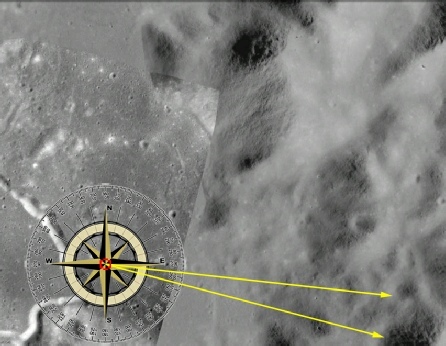 The compass rose in the image below left is centred on the Apollo 15 landing site, and the two arrows point to the location of the sun in the sky at the start (the upper arrow) and end (the lower) of their stay. The illustration on the right shows the sun’s movement in the sky over the same period. While the landscape is lunar in Stellarium, and the location ins Apollo 15, the actual scenery is from Apollo 17. Mons Hadley (north-east of the landing site) is 4500m in height, although the LM is sitting at an altitude of 1580m. As it’s such a striking feature it’s no surprise that many photographs were taken during the course of the mission. A representative selection of these is shown below. From left to right together with the times recorded at the ALSJ (top): AS15-87-11740 (SEVA), AS15-85-11404 (122:14:35), AS15-86-11603 (125:45:12), (bottom) AS15-85-11488 (143:56:47), AS15-90-12244 (146:30:33), AS15-87-11904 (167:49:38). 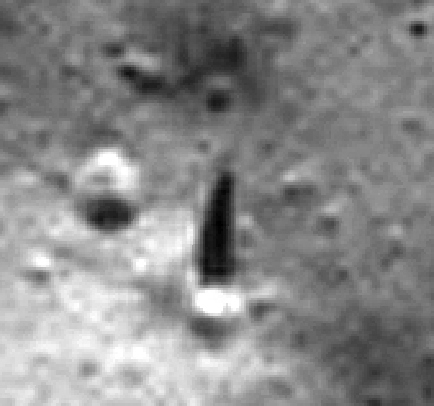 There is a very definite and obvious progressive lightening of the surface of Mons Hadley as the sun changes position throughout their time on the surface, and by the time the last image is taken it is almost entirely sunlit as the sun has moved to a much higher position. The way the hillside changes is entirely consistent with the movement of the sun southwards in the lunar sky and to a higher elevation as it does so. 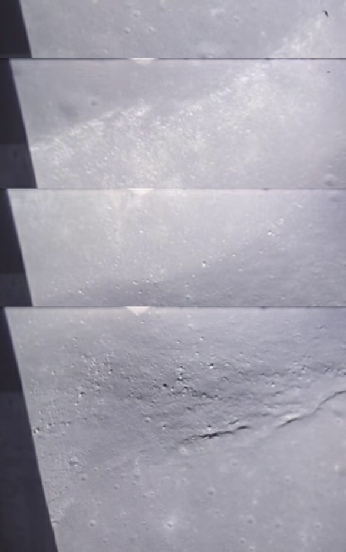 You may have noticed I was very specific about referring to photos of the LM ‘on the ground’ - this is because we do have one more piece of shadow to play with, namely the ascent footage taken by the 16mm camera from within the rising ascent module. There are numerous sources for the 16mm footage, eg at the ALSJ, but I will be using screenshots from my own copy of the Spacecraft Films DVD set of the mission. 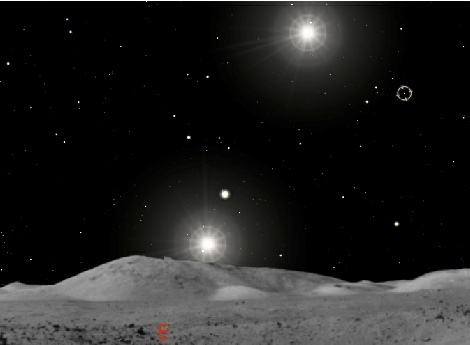 NASA’s own diagrams give an idealised depiction of how high the LM should have ascended after 10 seconds, and we can see this together with a still from the video and the line as measured on Google Moon. From our angle-distance website, we can work out that with the sun at an angle of 41.3 degrees above the horizon at lift-off, a shadow 100 metres along the ground should be cast by an object around 87.85 metres off the ground. If you look at the NASA diagram, you can see that after 10 seconds the altitude of the LM should be at 260 feet, or 79.25m. While we have an apparent discrepancy here of roughly 8.5 metres, give or take a few cm, we have a number of factors to consider. Firstly, I’m plotting on Google Moon, so it’s dependent on my accuracy and Google. Secondly, we’re assuming that the timing of the 16mm footage is accurate, and that the frame rate has been translated properly into seconds of digital video. At an ascent speed of 50 feet per second it doesn’t take much of a discrepancy to account for the difference here. Thirdly, we’re assuming that the LM took off perfectly vertically from level ground and we know that wasn’t exactly the case. 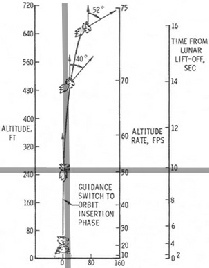 Finally, we can see from the vertical grey line on the diagram that there ought to have been some downrange movement by the time we get to 10 seconds - in other words the ascent module will no longer be vertically above its point of origin but slightly nearer the ALSEP. In other words there are more than enough potential sources of minor error in my back of the envelope calculations to account for the relatively small difference. It’s also worth pointing out that the shadow follows a trajectory on that is consistent with the direction of the sun. Stellarium’s depiction of the angle from lunar north as 115 degrees is a few degrees different to that depicted above, but again relatively small errors would easily account for this. 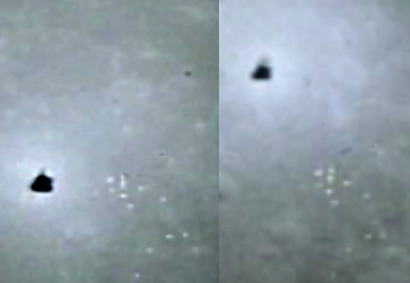 Conspiracy lovers like to claim that these videos were all done with ceiling lights. Its worth pointing out that if this was the case, an ascending lunar module would create a larger shadow on the ground as it got nearer the lights, not one that stays a consistent size, as shown here. Fully lit, hardly a shadow to be seen. For a really final look we have AS16-P-9814, taken at 21:08:56 on August 2nd, nearly 4 hours after the 16mm was taken. Here’s the same view of the rille as used before, and a comparison with a detail from the 16mm footage (16mm on the right). We can get some more useful information from another camera - the Panoramic camera used by the CSM from orbit. 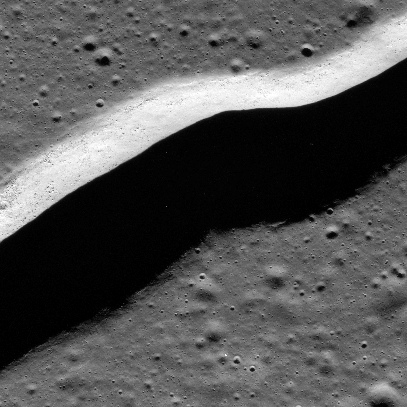 It captured several images of the Hadley Rille area, and high resolution scans of them at the ASU even show the LM. Here’s one example, AS15-P-9377, from which I have extracted the area surrounding the LM and also the rille itself. I’ve used different ones to those in this page, mainly because they show more of the rille. 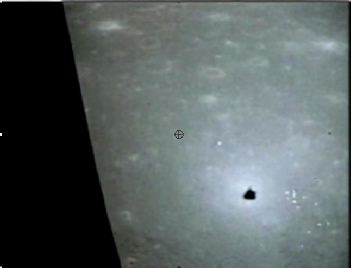 The exact time of this image (taken with the AFT camera) is given as 02:13:03 31/07/71, or orbit Rev 16, just after the completion of the SEVA. The obvious crater to the left of the shadow is the one labelled as ‘A’, and it’s clear from it that our estimate of where the shadow ends is not far off. We’ll return to other Panoramic camera views later. 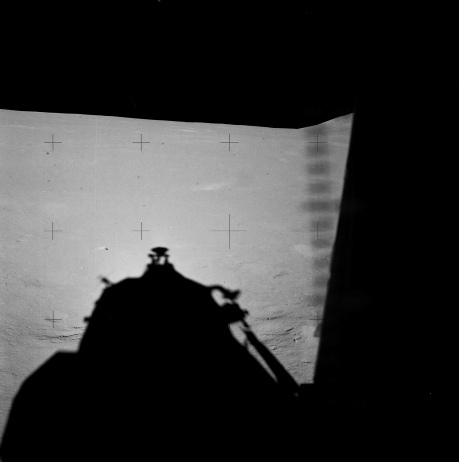 After the SEVA, but before the first EVA, a few more photographs were taken from inside the LM, with several of these showing the LM shadow. Below is one of the images (AS15-85-11384), next to which is a zoomed and cropped version overlain by the same area in AS15-85-11382 above. 11382 has been partially faded to show that the white rock visible in the 118384 was hidden by shadow before. 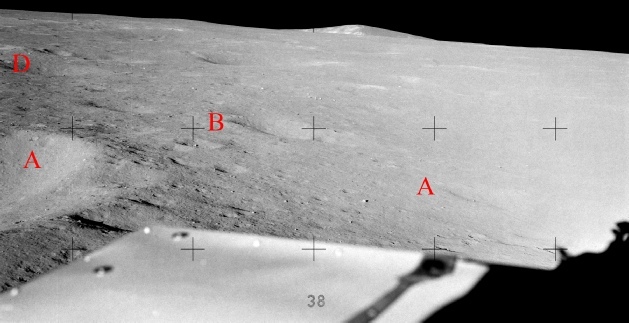 The crater labelled ‘C’ previously is in the top left of the cropped image. The first EVA started 12 hours after the end of the SEVA, with the time between occupied by a sleep period. No mention is made after the SEVA or before the EVA of additional photographs being taken, and most of the transcript after their wake-up call is occupied by preparations for their first trip outside. The magazine count given after the SEVA on magazine L is 33, which is three more than the number of SEVA images, but less than would account for the ones taken before EVA-1! This is somewhat less than helpful for our purposes, but assuming it was taken just before the EVA, the would be a minimum of 19.7 metres long. While the shadow has undoubtedly moved, it is arguably not that much closer. The transcript after they are woken suggests they were much too busy to take photos inside the cabin. The crew signed off the previous night at around 04:00 on the 31st, and a photo taken then would given a shadow length of around 27.5 metres, which looks to be consistent with the amount of change we can see. We can get an idea of shadow movement after the first EVA by looking at another Panoramic image from orbit. This time it is AS15-P-9427, which was taken at 23:52:35 on the 31st, 4 hours after the end of EVA-1. 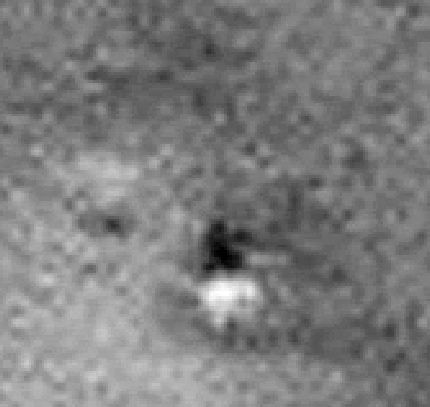 Although the quality isn’t as good as the previous image, the LM shadow can be made out clearly enough, and it has obviously retreated to a point level with almost half way into crater ‘A’. This would give us an approximate length of around 14.5 metres. Using the time of the photograph, we would be expecting a shadow length pf around 16.4 metres. Again, for reasons outlined earlier, we are short of the theoretical length, but it has self-evidently moved over time. This is particularly evident from the view of Hadley Rille, which has gone from being almost entirely in shadow to being almost fully lit. The next available LM shadow we have to look at is in the panorama of the LM we saw earlier. The transcripts at the ALSJ suggest a time for the photographs of around 17:05 on 01/08/71. This would give a sun angle of just over 31 degrees. Returning to a one of the photos comprising that panorama, we can see that the shadow extends to a point level with the centre of a small shallow crater. 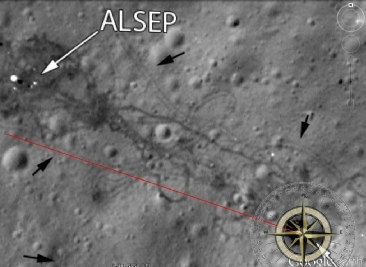 Below right is the view of the LRO also showing that shallow crater, together with a line that Google says should be 12 metres long. The shadow length of the LM with a 31 degree sun height is 11.65 metres, which again is very consistent with what we can see here. 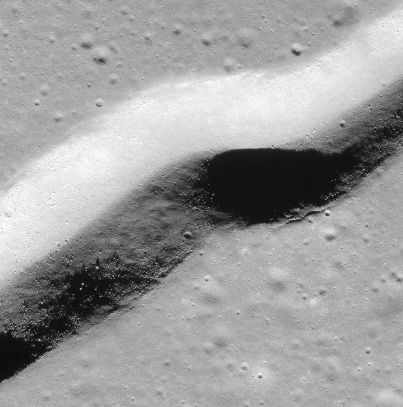 And seeing as we’re taking off, there’s time to take one more look at Hadley Rille itself, as seen from a composite of several 16mm frames. There is a difference in resolution thanks the way they have been treated so it would be unwise to draw any definitive conlcusions, but there is an undoubted match in the direction and length of shadows and both images are consistent with the time they were taken. So all in all what do we have here? A photographic record that is entirely consistent with astronomical reality, as is the 16mm footage. Why? Because we went to the moon.